Are you looking to really spoil them this Christmas? Encourage your other half, family and friends to the time to pamper themselves with an indulgent beauty or grooming gift. We’ve got suggestions for luxe makeup lovers, fragrance fans and well-groomed guys alike. Take a look at favourite Top 10 Indulgent Gifts for Christmas below, and see whether any of our choices is a perfect fit for those extra special people you have in mind. This classic brush set is a treat for fans of luxury makeup. Presented in a zippered pouch, the five essential tools include a powder foundation brush, a blusher brush, an eye shadow brush, an eyeliner brush and a lip brush, each of which provide a professional finish every time. The Guerlain Meteorites Pressed Powder in Wulong is one of the star products in Guerlain’s sumptuous Liu Christmas collection, and it’s a star product for a reason. Encased in a jewel-like compact embedded with a mother of pearl rosette, the harmony of six shades unifies, revives, illuminates and adds radiance to your complexion. Part sophisticated and part homely, this classic fragranced candle from Acqua Di Parma creates a warm and welcoming atmosphere. The mammoth 1KG candle has a hand-polished, cubed design embossed with the iconic Acqua Di Parma logo, and burns for an impressive 60 hours without disturbing the design on the outside. Exclusive to Escentual. This collector’s edition of the elegant Fan di Fendi Eau de Parfum is zipped up in a patent leather case that pays homage to Fendi’s leather-crafting roots. The scent itself is made of up vibrant notes including Calabrian tangerine, pink peppercorns and yellow jasmine, plus a soft leather accord in the dry down. Change the way dry your hair with this expert quality hairdryer from Ego Professional. Instead of blasting the water away from your hair, it encourages the moisture to be absorbed, making for really soft and supple locks. The high tech tool has a choice of 8 heat and speed settings, plus HW2 and Tourmaline which decrease drying time by up to 70%. An ideal accessory for fans of Jimmy Choo. With a high 20% concentration of perfume, the striking tiger orchid and toffee notes of the original Eau de Parfum fragrance are overdosed and made deeper with the addition of candied orange and amber essence. The specially reworked bottle is a collector’s item in itself. When you’ve found a fragrance favourite, there’s nothing like receiving the matching body products – especially when they look and smell as good as this offering from Valentino. Made up of protective and nourishing ingredients, your skin feels truly pampered. The scent of Alba truffle, Amalfi orange blossom and wild strawberry is the icing on the cake. Made up of burnished brass, wenge wood and pure badger hair, this refined shaving stand presents the best in Italian craftsmanship. Acqua Di Parma’s inherent fusion of design and functionality means that both the razor and the shaving brush have a quality look and feel – better still, the head can be replaced with a humble Gillette Mach 3 razor blade. Now here’s a gift for the ultimate niche fragrance fan! Etat Libre d’Orange are known for their irreverent humour, complex compositions and quality ingredients, and here they present a miniaturised collection of their fragrance classics. Scents range from the bestselling Don’t Get Me Wrong Baby and Putain Des Palaces, to the infamous Secretions Magnifiques. 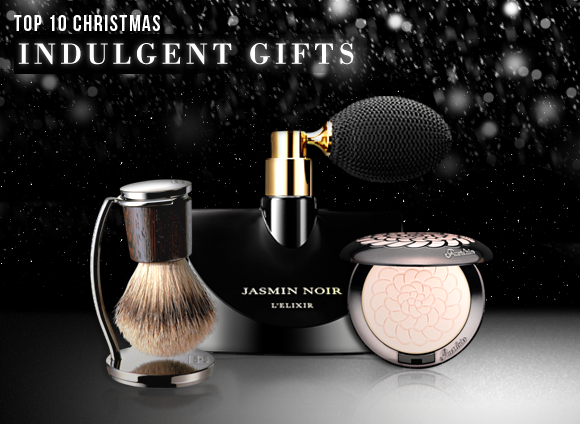 From its heavyweight packaging to its high-tech formulations, Guerlain skincare makes for a truly luxurious gift. One of our favourite ranges is Orchidee Imperiale, an anti-ageing collection that harnesses the natural power of the orchid in high concentrations. This discovery set is the ideal way to sample the best of the range. A beautifully presented product that will not fail to give pleasure to your loved one. Reasonable price for a high quality gift. This entry was posted on Thursday, November 22nd, 2012 at 9:02 am and is filed under Christmas, Fragrance, Make-up, Men. You can follow any responses to this entry through the RSS 2.0 feed. You can skip to the end and leave a response. Pinging is currently not allowed.